The young, peripatetic trombonist Chris Butcher divides his time between Toronto and New Orleans. By a stroke of good fortune (his mother is American and his father is Canadian) he is native to both cities. Better still, of course, is the fact that the language of Jazz is native to him especially in the dialect that is spoken in the proverbial home of the Muses; by Louis Armstrong, Sidney Bechet, the legendary clarinetist George Russell, and mighty bassist Alcide “Slow Drag” Pavageau, trombonist Big Jim Robinson, Baby Dodds and a whole pantheon of Gods. This in itself would give Mr. Butcher license to sing in the language of those ancestors. And he has made good the trust bestowed on him by gathering together a group of musicians of similar faith, together called The Heavyweights Brass Band and based in Toronto. 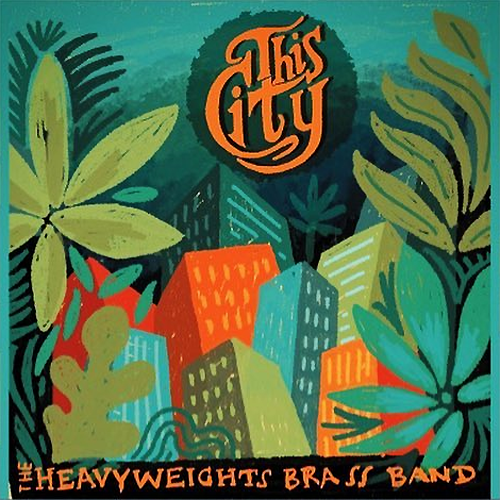 However, for this viscerally energetic recording, This City, The Heavyweight Brass Band decided to align their musical heartbeat – which proudly, naturally and brusquely beats to the NOLA rhythm – by bringing the music to The Big Easy itself, there to pay homage to the ancestors with eight boisterous and beautiful songs. The recording is a short one – extended-play length; but one that fills every second of the short (23 minutes and 11 seconds) with The Right Stuff. That means rollicking Second Line music – the quintessential New Orleans art form or a jazz funeral without a body, complete with the twirl of the imaginary parasol in the air – “second lining” with instruments instead. The core group of Mr. Butcher (trombone), John Pittman whose elemental wail on trumpet is legend, a roaring Paul Metcalfe on tenor saxophone, the instinctual growl of Tom Richards on tuba and a marching, always-yammering Lowell Whitty on drums. On This City The Heavyweights have been joined by a stellar cast that includes the vocalist and inestimable Jackie Richardson, prodigious guitarist Kevin Breit, “Mafioso” and trumpet-Don, Ashlin Parker, the legendary Joe Lastie on bass drum, über baritone saxophonist, Roger Lewis, with Eugene Grant and the effervescent vocalist Marla Dixon. With such star-power urging The Heavyweights ever onward, the music on This City is a molten mix of elegance and brute force, highlighted by Mr. Butcher’s human voice-like trombone on “Hands Down Lo’” to the growling tuba on “Two Foot Ticket”, and, as things move into overdrive, where Miss Richardson sends the spirit soaring on Steve Earle’s “This City”. The Heavyweight Brass Band, one might guess, are not simply in the great city of NOLA, but indeed, in Jazz heaven.